"If you want to be the best, you've got to beat the best." That's a adage that is often used in sports and that's the attitude young Auckland sailor Oscar Gunn is taking into what will probably be his biggest year so far in the sport. Gunn and crewmate Logan Dunning Beck head to Europe this weekend to start the process of securing a place at next year's Olympics. 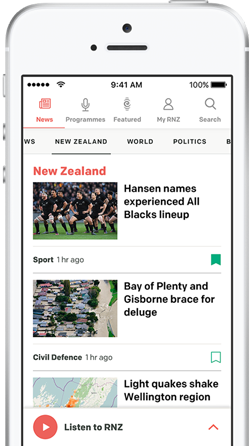 They're one of seven crews that are a part of the top New Zealand sailing squad that is aiming for next year's games in Tokyo. Unfortunetly for Gunn and Beck they'll be battling with Peter Burling and Blair Tuke for the one Olympic spot in the 49er class. Burling and Tuke finished second at the London 2012 Olympics and then had a run of 27 wins in regattas before winning gold in Rio in 2016. 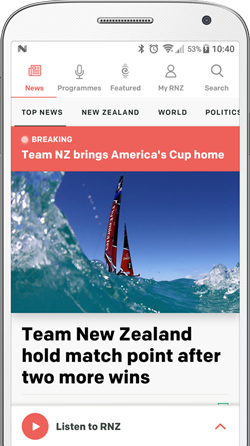 Since then they helped Team New Zealand lift the America's Cup and both sailed in last year's Volvo Ocean race. However they're back and keen to defend their Olympic title in Tokyo. 19 year old Dunn has been sailing with Beck for two years and in 2018 they finished seventh at the World Championships to qualify the 49er class for New Zealand for next year's Olympics. Dunn says it's a challenge that he's looking forward to. "Any other country we'd probably be sitting pretty safe but New Zealand is really competitive and we're trying to get the best sailors in the world so you got to be the best to get to the Olympics so we've got try and beat them." The two crews will go head to head in a number of events this year including next month's Princess Sofia regatta in Spain and the selectors will then make their nomination for Tokyo. Logan Dunning Beck helped Burling and Tuke prepare for the Rio 2016 Olympics and the two crews trained together for a couple of months this summer. Gunn and Beck actually beat Burling and Tuke at the Nationals, which Gunn says is very encouraging as it shows they've got some good speed. Gunn says the relationship between the crews is good. "We're both obviously trying, we've got the same goal, but no ones fighting each other it's realy if we work together we can get better than everyone else and then the best guy will go in the end and will be the best." Gunn wasn't sailing when Burling and Tuke had their golden run between the 2012 and 2016 Olympics and he says you couldn't help but admire what they did. "It was really cool to watch them do what they did between London and Rio and I was just witnessing it as a spectator and so it was pretty exciting to see them go out and do what they did. Since Rio and what they've done after that (in other boats) it's very cool and I've tried to learn from them. Gunn says the European regatta's are quite different from the nationals as instead of just 20 boats there'll be a hundred competing. New Zealand so far has six boats qualified for next year's Olympics in Tokyo.